We’d love your help. Let us know what’s wrong with this preview of The Deftly Paradox by M.D. White. Humanity has been ruled by a machine for five hundred years. Today it ordered their annihilation. At the close of a devastating war, humanity’s interplanetary senate acquiesced themselves to be governed by their first and greatest product of artificial intelligence. Unbound from feelings and incorruptible by power, their new thinking machine, the OSIRIS ruled the galaxy thro Humanity has been ruled by a machine for five hundred years. At the close of a devastating war, humanity’s interplanetary senate acquiesced themselves to be governed by their first and greatest product of artificial intelligence. Unbound from feelings and incorruptible by power, their new thinking machine, the OSIRIS ruled the galaxy through centuries of peace and untold prosperity. Five hundred years later, the OSIRIS has done the unthinkable: order the annihilation of one of the most populous planets in the empire. With the fleet on approach and ready to do the bidding of their callous master, the task falls to the OSIRIS’s technicians to find the source of the command, warn the wayward planet of their impending doom, and stop the fleet before they unquestioningly quench the lives of millions. To ask other readers questions about The Deftly Paradox, please sign up. This was very interesting, and well written, as well. I was intrigued with the way the author worked the choice of a cold, calculating, emotionless ruler over the greed and corruption of politicians the way he did, made for a sense of real in a surreal atmosphere. The characters were charismatic, fighting for humanity while trying to unravel the truth. It was very enjoyable and captivating! I very much enjoyed it. This one is a cautionary tale, wherein puny humans allow an AI to take over their government, and then, it orders their destruction. See? That's what happens, folks. This is why you always unplug the vacuum cleaner when you're done. You never know. I'm kidding. That's a joke. I love you, vacuum cleaner. The story drills into human behavior and the nature of artificial intelligence, while also being a thrilling adventure. It's a quick read, and asks questions -- while things bl This is good stuff. The story drills into human behavior and the nature of artificial intelligence, while also being a thrilling adventure. It's a quick read, and asks questions -- while things blow up. The Deftly Paradox was an interesting read. I really like the idea behind it - everything is rules by a machine that makes all decisions. People do whatever the machine says and don't really think about it anymore. I mean it has been so long that that is just the way things are now. But what happens when the machine calls for the annihilation of a very populated planet? Do you step up and try and stop it, try and figure out what went wrong, or do you do what it says because it knows what it is doing? The story itself was fun to read. There is a lot of detail and thought put into planning this out that make it more detailed than I was expecting. I enjoyed seeing how this task to wipe out a planet was found, the people involved in trying to stop it and those tasked to carry out the order and everyone else involved. It was interesting to watch and see how people reacted. People don't like change. Most people anyways. It is easier to stay the course and assume it knows what it is doing than shut down OSIRIS and have to start making decision yourself. I get it, but it is good there are always those people willing to step up and do what needs to be done at whatever cost. Now this story had lots of different characters with multiple storylines so you get to see everything that happens from different perspectives. For the most part I enjoyed reading this one. I enjoy thinking about the idea of humans not making decision anymore and what that would result in. What you would have to do to still have some checks and balances to make sure something like what happens doesn't happen, but how people would get complacent after a while and how it could really streamline a lot of things. My one issue however was the end section. I didn't really see some of the characters changing as much as they did as suddenly as they did. That is not really realistic and brought the book down a bit for me. Still was alright, but would have been better had the characters not suddenly done a 180. Oh well, a fun read nonetheless. I love meeting people who have creative minds. This author definitely has one. The idea of a society putting all of their faith in decision-making into the hands of a machine is actually terrifying to me. I say this because a machine begins with man. Even if the artificial intelligence is capable of learning, you know there has to be a glitch at some point. Then we become man vs machine. As I was growing up we had I received a copy to facilitate my review. The opinions expressed here are my own. I love meeting people who have creative minds. This author definitely has one. The idea of a society putting all of their faith in decision-making into the hands of a machine is actually terrifying to me. I say this because a machine begins with man. Even if the artificial intelligence is capable of learning, you know there has to be a glitch at some point. Then we become man vs machine. As I was growing up we had sci-fi movies that would give scenarios like this and it was never good. I have to say this book goes above and beyond. You have two sides of the issue a machine that has decided to wipe out an entire planet and people who believe in this machine. Then you have the side that has taken a step back and decides that the machine doesn’t necessarily know what is best. They will risk everything to stop it. Because of what I am teaching in school right now my mind began to draw parallels. My English 1 class is reading the book “Night” by Elie Wiesel. One question the students kept asking was how people could just blindly follow Hitler? They also wanted to know why those who knew it was wrong didn’t step up? It was the same with this book. People in both cases reached a point where it was easier to blindly follow. Those who decided to do something, willingly took the risk, knowing what the cost could be. The characters were well developed. The worldbuilding was wonderful. I was there. That is why it seemed so realistic and possible to me. In this day and age with technology being ramped up the way it has it makes you wonder if we will ever be stupid enough to turn our world over to a machine? Just asking. I would definitely recommend this book to all science fiction lovers. This book is about the conflict between man and machine. It starts with a senator (Deftly--of a state, a planet, a galaxy--we don't know) upset with the corruption rampant in the government. He proposes that people turn over the government to an Artificial Intelligence that is named Osiris. I looked up the mythology of Osiris: Osiris is killed by his brother, but brought back to life briefly by his wife, Isis, so she can become pregnant with his son, Horus. Horus is thought of as a representativ This book is about the conflict between man and machine. It starts with a senator (Deftly--of a state, a planet, a galaxy--we don't know) upset with the corruption rampant in the government. He proposes that people turn over the government to an Artificial Intelligence that is named Osiris. I looked up the mythology of Osiris: Osiris is killed by his brother, but brought back to life briefly by his wife, Isis, so she can become pregnant with his son, Horus. Horus is thought of as a representative of new beginnings and the vanquisher of his father. The AI is built and runs everything. For a while, there are no problems or disputes, but can a computer built by imperfect men ever be considered perfect? One day, Osiris gives an order to destroy the population of a planet. Forces are immediately dispatched to do so, but other people begin to question the order. Why is this planet being destroyed? What did the people do to deserve annihilation? Obviously, this is viewed as an emergency and a team of experts starts to work through the programming to determine if there was an input error, a virus, or a problem with the AI itself. Has the AI achieved awareness or did a human corrupt its programming? It's a race against time, and this is the part that didn't feel right to me. With so much on the line, the intensity of the people involved should have jumped off the page, but I just didn't feel it. I admired their intelligence, dedication, and ingenuity, but I didn't feel particularly alarmed about the people of the planet. Part of that may be because of the descriptions of time and space and speed weren't explained adequately. It just seemed if someone needed to be somewhere, he or she was. I very much enjoyed the book, however. The AI represents a new beginning for humanity, as the son of Osiris is described in the legend. It also describes the conflict between human emotion and the supposed perfection of logic and intelligence very well. Horus is born of vengeance and love, with Osiris being the father (love); however, a part of him is borne to avenge his father, so he is an imperfect being. Which one is Osiris the AI? The book is well-written and goes by quickly. The characters are interesting, witty, and intelligent. I definitely recommend this book. 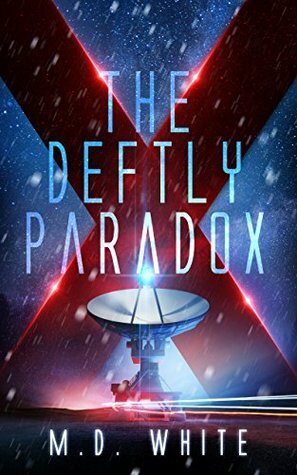 The Deftly Paradox is a perfect science fiction novel. Towards the end I was standing up reading it as if I could help the protagonists in their fight. Please write more stand alone novels, sir. I don’t read series unless I have to. I loved it.